Jenny particularly loved this book when she was in 5th grade. Harriet is a spunky, smart character. We had fun making this song sound like 60’s spy movie music. 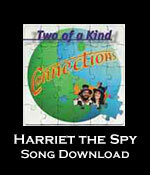 This song is also available on Two of a Kinds Connections CD.